It turns out that the ‘lost tribe’ widely reported to have been found in the Brazilian rain forest a few months ago had only been temporarily misplaced. In truth, the Brazilian Indian Protection Agency (Funai), had known about this nomadic group for years. Survival International, the organisation that released the pictures along with Funai, conceded yesterday that Funai had known about this nomadic tribe for around two decades. It defended the disturbance of the tribe saying that, since the images had been released, it had forced neighbouring Peru to re-examine its logging policy in the border area where the tribe lives, as a result of the international media attention. Activist and former Funai president Sydney Possuelo agreed that – amid threats to their environment and doubt over the existence of such tribes – it was necessary to publish them. Two things strike me. First, we expect hard-ball tactics and outrageous propaganda from anti-environmental groups, but not from our idealistic conservationists. Were it only a matter of making something up, ok, bad enough. But strafing a village in order to get the photos? Poor form indeed. The former Funai president Sydney Possuelo defends the lie by saying it has caused Peru to reassess its logging practices. Yes, perhaps. But in the process it has destroyed the credibility of Funai and weakened the claims of other conservationists by association. Second, what is behind our fascination with “lost” objects anyway? Sumathi Ramaswamy writes about this in The Lost Land of Lemuria: Fabulous Geographies, Catastrophic Histories (California: University of California Press, 2004). Loss, in her analysis, is a constructed thing, something we “make missing” in the past to satisfy social or political concerns in the present. (I will post a full book review on Thursday). The theme of the lost civilization or tribe catches fire in the nineteenth century and keeps burning into the 20th. For examples, see Journey to the Center of the Earth by Jules Verne (1864) or the The Wonderful Wizard of Oz by L. Frank Baum (1900)). The eagerness to capture lost peoples and places comes just as white Americans begin to seriously fret about the closing of the American frontier, race suicide, and manly decline (see Manliness and Civilization: A Cultural History of Gender and Race in the United States, 1880-1917 by Gail Bederman for a good synopsis of this). In any event, the Funai hoax proves that cult of the lost tribe is still alive and well in the 21st century. What gives? This was not outrageous propaganda. There may have been some media misunderstanding, but from the moment the photos emerged, Survival International (the global movement for tribal peoples) and FUNAI (the Brazilian Government’s National Indian Foundation), which supplied the photos, have not said that the tribe was ‘unknown’ or ‘lost’. 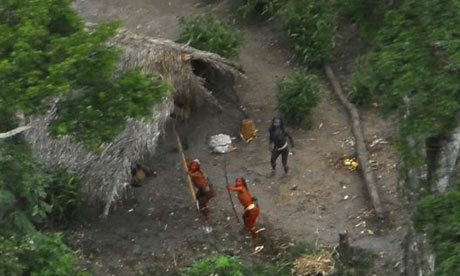 The tribe was and remains ‘uncontacted’: no outsider has been known to have any peaceful contact with its members. This is true of about 100 tribes worldwide. Since the photographs were released, Peru has acknowledged the lands of uncontacted tribes on its side of the border, and sent a team to investigate the illegal logging that threatens their survival. Matt, thanks for the comment. I will check out the Survival article you posted. The Guardian credited at least two sources in their story, SI itself as well as Sydney Possuelo. Are you saying they got these wrong? Great blog you have here, and a very interesting research subject. The way westerners continue to cling to outdated notions of “discovering” peoples whoe are “unknown” is a source of both fascination and irritation to me. It is one of the few instances where the rampant ethnocentrism becomes glaringly obvious, instead of just implied. I do think media and journalists have a lot of responsibility for this. So much is driven by headline grabbing events nowadays. Don’t look a gift horse in the mouth, just write it up for all your worth… Blogs by genuine researchers can at least help balance this superficial view of the world a bit. 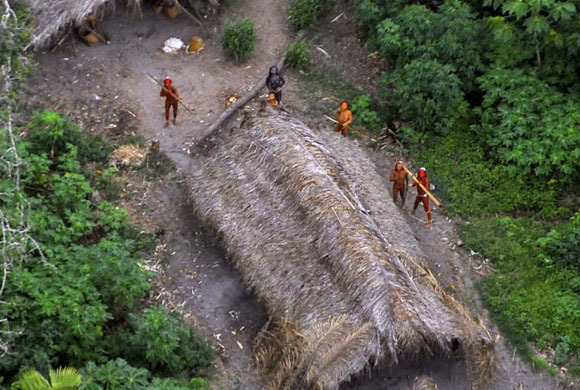 I wrote about this myself shen it happened (archaeologist and anthropologist) and was sure from the start that at the most they were uncontacted by westerners. There can be no doubt that any group of human beings must have contact with other groups. Just because these groups don’t wear baseball caps and drink coca-cola does not mean that they are “lost in time”.